LS-F39422 is a 96-well enzyme-linked immunosorbent assay (ELISA) for the Quantitative detection of Human FAM214A in samples of Plasma, Serum and Tissue Homogenates. It is based upon a Competitive EIA assay principle and can be used to detect levels of FAM214A as low as 0.469 nanograms per millilter. 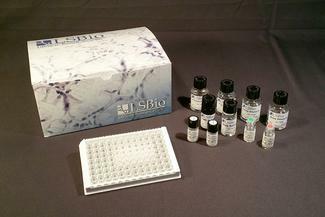 This ELISA kit uses Competitive-ELISA as the method. The microtiter plate provided in this kit has been pre-coated with FAM214A. During the reaction, FAM214A in the sample or standard competes with a fixed amount of FAM214A on the solid phase supporter for sites on the Biotinylated Detection Antibody specific to FAM214A. Excess conjugate and unbound sample or standard are washed from the plate, and HRP-Streptavidin(SABC) is added to each microplate well and incubated. Then a TMB substrate solution is added to each well. The enzyme-substrate reaction is terminated by the addition of a sulphuric acid solution and the color change is measured spectrophotometrically at a wavelength of 450 nm. The concentration of FAM214A in the samples is then determined by comparing the O.D. of the samples to the standard curve.